One of my favourite comfort foods has got to be Claypot Chicken Rice. Each time I smell it cooking in my conventional rice cooker, my heart quickens and my mouth waters. Imagining the delicious taste and fragrance of Chinese mushrooms, Chinese sausages (lap cheong) and salted fish usually drives me insane with delicious anticipation. I posted this “recipe” a while back, but have realised that I never gave any ingredients list, just a step by step, cooking process. I’ve been using this delicious recipe from Amy Beh since my uni days, and it’s never failed me. Lacking the patience and the use of a large claypot, this recipe utilises a conventional rice cooker! I have modified it throughout the years, so my measurements and quantity will defer slightly from Amy’s recipe. I do hope you enjoy! Mix the marinade ingredients with the chicken and let sit for a minimum of 30 minutes. I like leaving it for close to an hour, as it allows the chicken to absorb all the delicious tastes from the sauces. Whilst the chicken is marinating, soak some dried Shiitake mushrooms in hot water, to rehydrate them. Slice the lap cheong (3mm slices) and set aside. Once the mushrooms have been plumped up by the hot water, drain and squeeze out the excess water. Slice the mushrooms and set aside. Slice the salted fish up into tiny pieces. In a small saucepan, heat up a tablespoon of vegetable oil, and shallow fry the salted fish pieces. Add a teaspoon of sugar (if you like), to caramelise the salted fish. Set aside for garnishing later. In a rice cooker, cook the rice according to the manufacturer’s instructions. A general rule is to cover the rice with water until the water reaches the first line of your index finger (from the top layer of the rice, not the bottom of the pot). In a large wok, using a tiny teaspoon of oil, shallow fry the lap cheong (the lap cheong will release quite a bit of oil whilst being fried). Once the lap cheong has been cooked (slightly charred), dish out and set aside. Drain excess oil and keep about 2-3 tablespoons of the oil in the wok. Toss in the chicken and fry with the lap cheong oil. Drizzle in the drizzling sauce and fry until the chicken is semi-cooked. 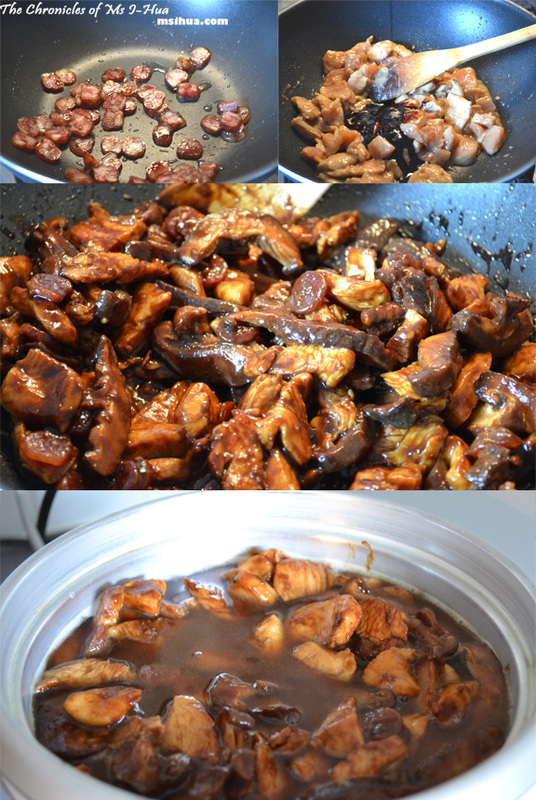 Add in the Chinese mushrooms and lap cheong and toss. Turn the heat off, and remove the wok from heat. 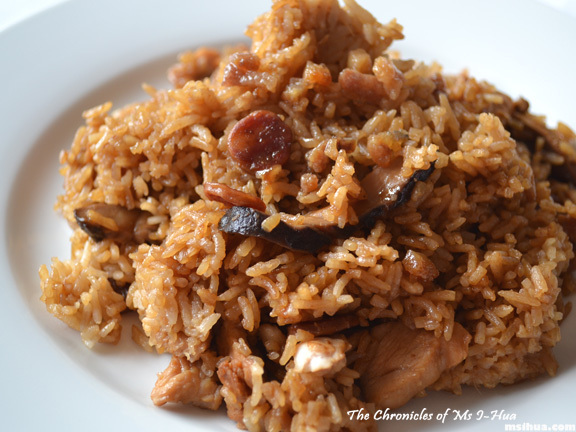 Once the rice in the cooker starts to bubble, mix-in the chicken mixture and cover until cooked. Once the rice is cooked, mix the rice together, to incorporate the chicken thoroughly with the rice. Serve hot with a sprinkling of the caramelised salted fish. Although it does sound like a lot to do, this usually takes about 20-30 minutes (a bit of prepping) and fills about 3-4 hungry people. If you are cooking for a larger crowd (which I’ve found myself doing occasionally), double the ingredients and sauces and this recipe still works! Have you tried Claypot Chicken Rice before? How does yours differ from mine? Yum! I’d love to try this recipe, I have cooked it once before and although it was yummy not amazing, but I should have another go…..
You should! It’s my favourite! IS IT OKAY IF I DON’T USE SALTED FISH. Michelle chin recently posted…Review: Cakes at RT Pastry House @ Tokyo Street Level 6, Pavilion KL. That’s why I’ve got it as OPTIONAL la!!! Yayy! Where’s your mum going this time? Yum! What a fab recipe. I reckon I might cook this dish, this weekend. When do you turn 30? Are you going to do something amazing and big to celebrate? Anna Johnston recently posted…HAPPY NEW YEAR – OH IT’S GOING TO BE A BIG ONE! Next year! But it still seems too quick! Eeek! Wow you made this in your rice cooker?!? I didn’t know it was possible 🙂 My mum’s loves this! I’m definitely going to try this because i’m sure Mr Bao will be So impressed with me hehe! Great idea to do this in a rice cooker, that makes it so much easier. I must give it a go. Oh my.. you are comparing it to your mother’s!! OH MY!! I just cooked it tonight! Made many mistakes, but still nice. 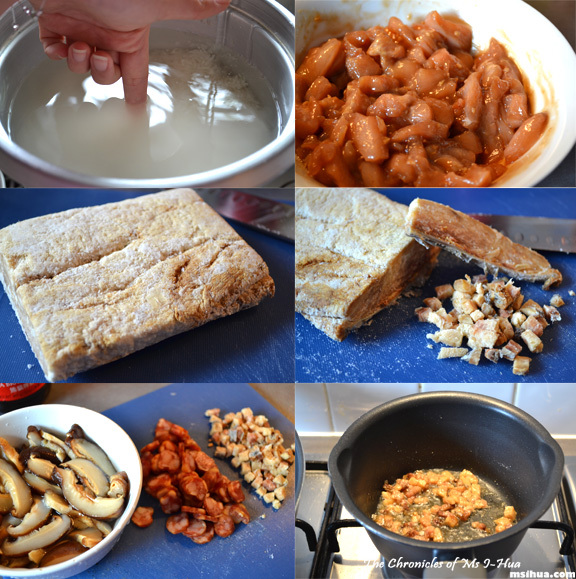 I love the idea of frying the Chinese sausage and salted fish. Never tried caramelised salt fish either, mmmm… next time! No such thing as a mistake if it’s still good Boo! [email protected] recently posted…Travelicious Tours – cupcakes and chocolate and butter, OH MY! You should try it! I love my rice cooker…!!! Mmmmmm, I loovveee a good claypot chicken rice. Looks delish! My parents swap between using the claypot and the rice cooker…although I like the claypot cause there are crispy bits to scrape up off the bottom! Totally craving this dish…. I should move back home so I can make mum make it for me whenever I want 😛 …. i need to get me a rice cooker! hmmm… maybe see if the TM can do it! yummmmmbo! You could but I don’t think there will be crispy bits… 😛 And then you will have to throw your TM away.. OR GIVE IT TO ME!!! i love that claypot rice.. that sure looks so so good. Really? That’s awesome! I’m cooking like an Asian mum! AUTHENTIC!!!! Where is a good place to get salt fish in Melbourne? This is a new ingredient for me. Hi Su Yin. You can get salt fish from most Asian Groceries. It is usually in the frozen section, but ask the staff, they should be able to lead you to salted fish. Oh dear – it would appear I put the chicken in the rice cooker too early and my rice isn’t cooking. How do I save this??? Eeep! I do hope you managed to salvage this! I would have put the rice in a pot and boiled it over the stove instead if that was the case *fingers crossed* that worked for you! PS. Stupid question, but where can you buy salted fish like that from? Libby recently posted…Chicken Butter Cream, Get on Top! Oops sorry Libs! I didn’t see this pop up and obviously so lost.. I hope you found your salted fish! Most Asian groceries sell them! Made this today! Had no salted fish and ginger. Used 2 cups rice instead and took too long to prep as I was busying cutting out the fats from lup cheong.. N the rice was cooked by the time I’m done stir frying.. But guess what? Hubby gave me distinctions! I added chicken rice black sauce, coriander, cut chilli and fried shallots as garnishing! Well done! We never have the right recipes when cooking either and love improvising!! hey thanks for the great recipe!i tried and it taste very nice!but i got top up vege also!hehe..the only thing i need to ask will ur rice very sticky?my water level i put a bit more water than usual and it lead my rice very sticky!but smell wise very nice!i will definitely try out next time with lesser water! It would be slightly stickier than normal white rice (which can be quite dry) so don’t worry. It is meant to be that way. Maybe because you had too much vegetables? 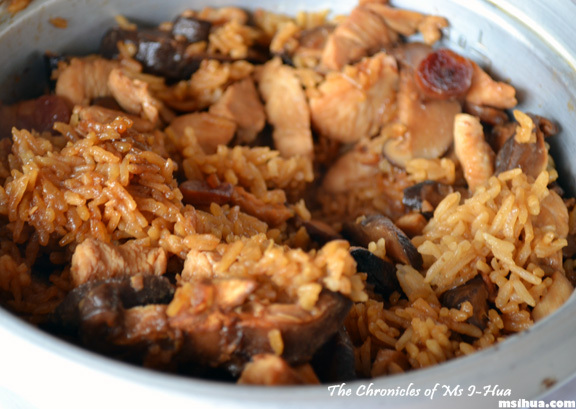 I love claypot chicken rice and glad to have found this recipe using rice cooker. As I’ve stopped eating pork, is it ok to omit lap cheong or it’s the main ingredient for flavouring as chorizo in paella? Sorry, I guess I wasn’t clear. I wasn’t planning to use lap cheong at all and wondered if it would still taste delish without it. Guess I’ll just have to try it out! Ps.no I wasn’t thinking of subtituting it with chorizo. Heehee. I bet if using chorizo, it’ll end being a spicy/reddish claypot chicken rice! I just made this for dinner tonight too! I made this two nights ago, and it was GREAT! I completely cooked the chicken and rice separately, then mixed them together before serving. I used streaky bacon instead of lap cheong. But I think the Chinese sausage would probably be better. The marinade smells WONDERFUL, and I let it sit for 90 minutes in the frig before cooking. Hooray.. I love her recipes! I’ve looked at other recipes and it suggests to add the meat and lop cheung to the rice when its 3/4 cooked in the rice cooker (when the water is almost all gone). Is it better to do that or do it when the water bubbles as you suggested? HI…where could you get the wine? Is it available at wine stores? It’s delicious! Hope you enjoy!